Mark your calendars: February 29 is the date! Jericho is back and he’s brought Hell with… Oh wait, someone already made that line famous. Anyway, it’s probably a little more accurate to say he’s trying to keep Hell from coming. 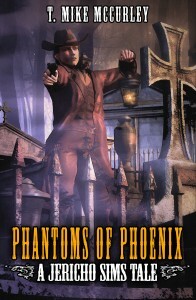 Either way, Phantoms of Phoenix is up and running, and on February 29, it will be available for full order. You can get in early, though, just by clicking the picture below! Rolling into Arizona following a rumor about the Surgeon, Jericho finds himself facing the denizens of the local graveyard, raised from their slumber as the invading army of a necromancer bent on revenge. Jericho will need his quick wits and lightning gun hand as he teams up with a local preacher and a spectral restaurant owner to save an entire city from a legion of the dead. Intrigued? Don’t wait! You can pre-order it at Amazon. Click the pic and reserve your copy for only $0.99! “The author’s name is on the front,” replied his wife. She scarcely looked up from the trigger assembly she was polishing. “Sounds like a busy man,” she said. He stomped his way into the kitchen, muttering mockingly as he went. Yeah, I exaggerated this one. It was fun, though. She had a beautiful hibiscus tattooed on her left shoulder, and Synn sighed as he saw the exquisite artwork. Delicate petals and vibrant colors made an image that was the kind of thing he would normally have enjoyed looking at from a closer, more personal, angle, but the woman being dead rendered that train of thought completely moot. One hand was still clutching at the cluster of carbon-fiber needles in her neck. They were centered right above the marks left from the violent removal of her string of pearls – pearls which even now lay strewn about the scene of her demise. In the old world, they would have tracked her killer with satellites. Before that, maybe with a basset hound or other sniffer dog. Now, they sent Synn or one of those like him. Gengineered for tracking and combat, Synn was agile and strong. His enhanced senses could follow a scent trail or see clues others would easily miss, and decades of training and deployment – both real and hypno-sim – made certain he knew how to interpret the results of what he found. “She reeks of gin,” he said. A microphone link carried his words to a monitoring computer to form a journal of his observations. He wore a series of small video links as well, and when returning from his mission he could hook straight into that computer to build a more complete document.